.We have an abundance of technologies and web & mobile app development languages surrounding us, but foremost call lies in selecting the one that reverberates with your business requirements. If we go with the latest statistics, the language that is making a huge pace and also covering the web & mobile app development landscape is AngularJS. Well, being in the latest era, if you are wasting your much time in developing a web & mobile application than just stop right now and opt Angular JS as your first choice. It helps in gathering data and also helps to keep developers at bay from adding extra source code and eliminates extra code in order to maintain the flexibility of the code. Apart from the aforesaid basics, it assists to influence J-query DOM libraries. Specifically, Angular JS permits developers to increase the functionality of HTML by adding constructs. In addition, it also helps in abstracting DOM alteration and manipulations, making everything a lot easier. You may have an awesome project idea in mind, so it is obvious that it might or might not go with the AngularJS development scenery. But due to useful features & beneficial characteristics, it fits as the perfect web & mobile app development solution. The basic characteristic of Angular JS development is its straightforward design architecture currently used by the developers. It is easy to learn & implement, and it enhances the features to a great degree which any particular customer requires. When it comes to supervision of profound web apps which contains various components as well as complex necessities, it works tremendously well. AngularJS comes with readymade and flexible solutions that can be used within the app. It provides customized solutions such as UI routing approach and module practices can be used. If we come on time-saving, AngularJS helps in attaining it as it requires lesser time to code the entire mobile or web app since it is the latest technology derived from HTML. Developing mobile & web apps with AngularJS is quite easy, quicker as well as require less effort. 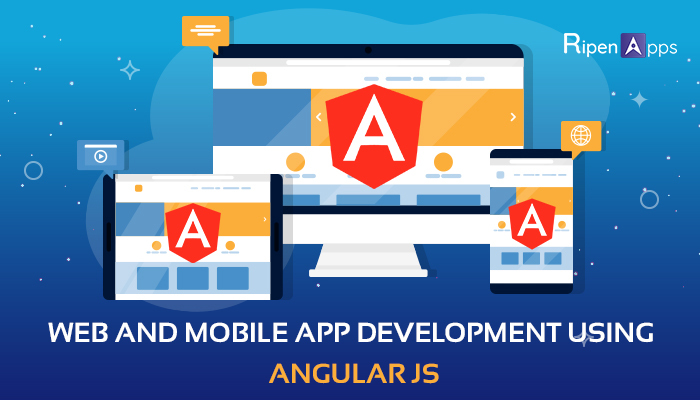 AngularJS mobile & web app development requires less coding which helps the developers to place extraordinary focus on the competence of the app rather than writing the codes. In many cases, developers have to write the same code again while building an app, particularly in HTML. AngularJS solves this problem as the developer can effortlessly reuse the same code which he has written before. One of the modern web app development procedures is Model-View-View-Model or MVVC architecture which is supported by AngularJS. When it comes to unit testing, AngularJS provide much-needed support. The testing is simpler and much supple at the different phase of development. It also has impressive testing compatibilities. In case, if you are hoping to gain amazing prevalence in a niche, select the one that has its own gestures and matches with the application development prerequisites. Aside from this, it must have its very own portfolio involving the applications that it creates and its own arrangement of advantages. These are the applications that give information to the users about the activities they are keen on taking. Along these lines, they can without much of a stretch recognize the best solutions and can save money. Since these apps involve dynamic features, AngularJS helps in developing refined travel apps. JetBlue’s is a great example in this slot. We can set Freelancer.com & Upwork.com as the best example of content portals, developed by using Angular JS. We all are familiar with these portals, as they handle a huge amount of data, information of the user. LinkedIn is the best example, developed by Angular JS. We are familiar with its popularity. Angular JS is the best choice for developing video streaming apps. The most prominent examples are YouTube and Netflix. To be exact and legitimate, with the copious of marketing practices on existing around the bend, discovering the genuine worth of items has truly turned into a tough task. In the long run, finding the correct development tool for building an application is much harder. AngularJS is without a doubt an obvious winner in the present time inferable from such colossal advantages, yet one must counsel the correct mobile application development company or specialists before continuing with the mobile app development process.